Esayi Hasan Jalaleants’ was the Catholicos— the Supreme Patriarch of the Holy See of Aghuank’ (Karabagh-Artsakh and Ganje-Utik’)—from 1702 to 1728. This tenure coincided with the temporary decline of the Mother See of Armenia at Holy Etchmiadzin. Using this decline to his advantage, Esayi managed to establish close ties with the Russians and the Georgians and was instrumental in encouraging Peter the Great to invade Transcaucasia and Persia in 1722. 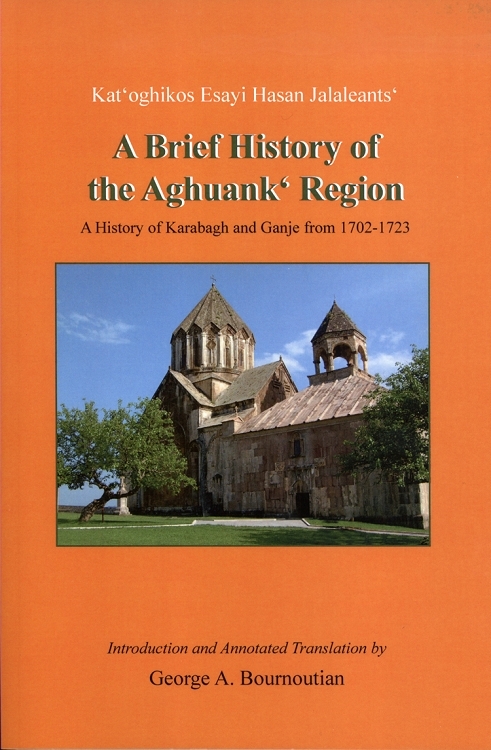 Esayi’s Brief History of the Aghuank’ Region—a region composed of the historic Armenian provinces of Artsakh and Utik’—concentrates on the Armeno-Georgian struggle against incursions by Lezgi tribesmen and the Armenian and Georgian hope for the arrival of the Russian army to liberate them from Muslim rule. The book covers the years 1702 to 1723 and sheds light on the Persian Safavid Empire during its decline and final collapse. This is the first English translation of Esayi’s important primary source and confirms the existence of a large Armenian population in the Karabagh-Artsakh region long before its conquest by the Russians in the nineteenth century.